And yesterday’s rain-soaked paper sitting on the lawn. I wrote this poem a few years ago, right around the time that I quit smoking (again). I started smoking the first month of my first year in college, right around September of 1990. I was so stressed and everyone else drank on the weekends, but was not (and still am not!) a partying drinker; coming from a background of extended family alcoholism, I thought it best to drastically limit any alcohol intake; but had few coping skills when it came to stress. Some random girl was smoking outside of the student union on Pitt Campus and I thought – “Wow! She looks so relaxed!” and asked her for a smoke. And for twenty years (except for when pregnant and nursing), that was my main stress reliever. Am I smart girl? Sure. I knew that cigarette smoking causes lung cancer, bladder cancer, mouth cancer, esophageal cancer, tongue cancer, breast cancer, and wrinkles. I knew that smoking causes social separation (especially at parties where you are the only person doing it), family conflict, marital discord, anxiety in your spouse, and bronchitis in the winter. I knew that I hated getting bundled up during winter to smoke on the back porch; furtiveness (because who wants their kids knowing that they smoke?? what a bad example); sneaky behavior that can be misinterpreted as something else; and disappointment in the people who love you, and really root for you every time you quit. That’s such a final word. But for most smokers, it takes an average of EIGHT TIMES before they are successful. EIGHT TIMES. Not even 15 years ago, it was four times. What has happened in the meantime?? Well, cigarette producers have gotten crafty. They have bred tobacco plants specifically to increase the level of addiction in consumers (which is what you do to cigarettes, you CONSUME them. 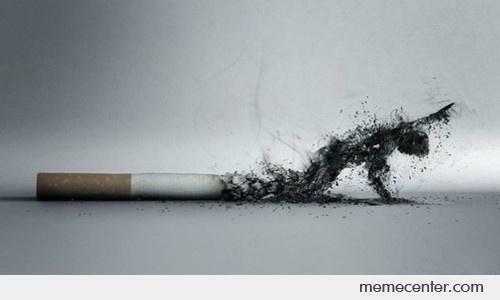 What’s left of a cigarette when you are done? just the filter.) They have changed the additives that they put in their product in order to make them more appealing, tasty, increase their shelf life, pleasant to inhale. They spend millions of dollars a year to keep you hooked. So when I had decided to change my tact, to really create a quit-successful internal atmosphere (in my brain. in my SOUL), I went whole-hog. I recruited two lifelong friends to be my accountability partners (thanks Su and Lisa!) – aka BABYSITTERS – who I knew would consistently and usefully guilt me. I threw away all lighters. I changed up the back porch furniture configuration to make it an environment hostile to smoking (removed my “favorite” chair, threw away the coffee can under the bush so that I wouldn’t have a safe place to hide butts, and I set a date for final quit. New Year’s Day. I also “came out” on facebook. And it worked! IT WORKED. Knowing that all the people that I loved (or even casual friends) could hold me accountable for my actions; that my best friend, my husband, was quietly and cautiously rooting for me – he had watched me quit SO MANY TIMES BEFORE and was very gentle and nonjudgmental; reading all the research on how you increase your health, lifespan, and quality of life, and decrease your chances for every type of cancer and other horrible diseases; and actually watching online videos and looking at photos of people who had whole parts of their bodies cut away in order to remove cancers that smoking had caused; IT WORKED. How does this connect to my children, my motherhood? I couldn’t sit by and continue to do something that I would smack my teenager for if I caught him doing it. I couldn’t let myself continue to do something that might kill me before my parents passed away; leave my children motherless; leave my husband wife-less (is that even a word); leave a legacy of people tsk-tsking “She was so young” at my funeral. When you are a mother. There. Is. No. Such. Thing. This entry was posted in Uncategorized and tagged 20 years, addiction, children, future, health, husband, mother, quitting smoking, smoking, so much time, time by anonymom. Bookmark the permalink. First, I love your poem in the beginning. Love it! It’s so strong: “I feel like good advice well-taken.” Wow. Second though: the way you mapped out some quit-smoking tactics here I’m going to pass along to Jeff. Ooh, he’s such a stubborn Monster, but I know (intellectually) how hard it is to do this. Hard. And you did it! So proud of you. You are an inspiration and I’ll show Jeff why : ). Yes! very difficult. I literally had to everyday convince myself that I was a non-smoker. Especially when I was stressed, it was HARD. But it worked! After the first three months, I never physically wanted one; after six months, didn’t want one at all.